My hopeful VBAC ended in uterine and bladder rupture. Thankfully, my baby and I survived this crazy and trying day. Here is the story of Calvin’s birth. I don’t know how this happened, but one week ago tonight I was timing contractions and thinking that I might be in labor. We were set to have a Doctor’s appointment the next day and most likely schedule a c-section. 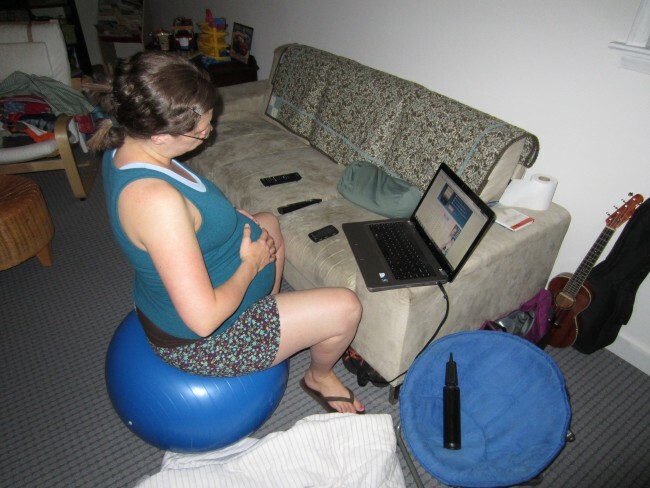 I had hoped I would get a chance to go into labor spontaneously and have my VBAC and Wednesday night, it seemed like everything was working out perfectly. In the middle of the night we decided to go into the hospital. My contractions were 3 minutes apart and getting more intense with each one. I am not going into all the details of this birth story as it was very different than Oscar’s and honestly, I just don’t have it in me. After 22 hours of labor including 45 minutes of pushing, we (me, my support and my Dr) unanimously decided I needed a csection. We didn’t actually KNOW why, it was just a gut thing. And it probably saved my life. 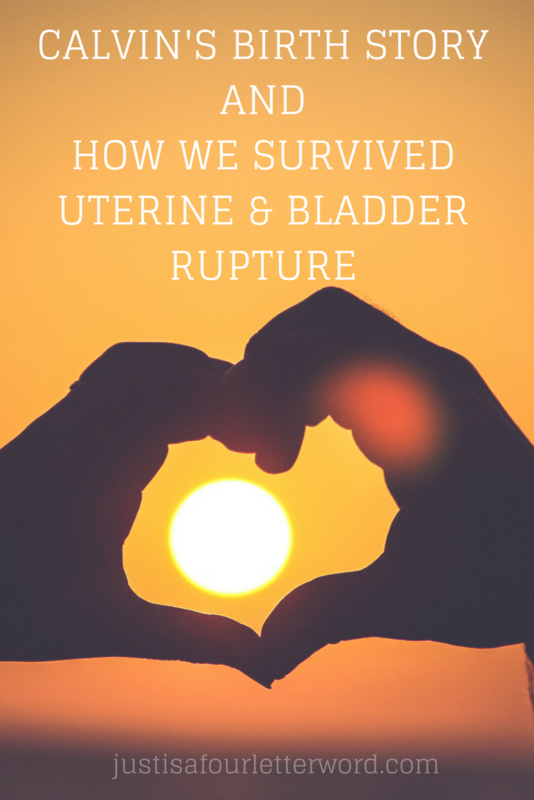 Once the surgery started, they realized that I had experienced both my uterine and bladder rupture. Uterine rupture is always a risk for a VBAC hopeful, but I had been a great candidate and both of our vitals were always great. Even the “high” 2% risk seemed worth the gamble. I mean who wouldn’t focus on the 98% chance that my uterus WOULDN’T rupture? I digress. So my 1 hour surgery turned into a very traumatic 3 hours and while Calvin was born and whisked away safely in the first few minutes, I was left to tough it out and get fixed. I sent Jerry off to stay with the baby as was our plan in case of a c-section, but neither of us knew how serious the surgeries were nor how long we would be apart worrying about the other. There are a lot of “could haves” in this scenario. The outcome for me and Calvin could have been catastrophic. I could have needed a hysterectomy, I could have a long painful recovery. Thankfully, the Surgeons did exactly what they were trained to do and here we are a week later with a few battle scars but feeling good, all things considered. Calvin’s APGARS were 8 and 9 just like his big brother. Neither of us ever showed signs of distress during labor which threw everyone off the scent of rupture. During pushing, I started getting mentally looped out and throwing up. This was well after transition so we knew something was up. Jerry asked all the Doctors and staff to leave us and my mom to talk. We all felt the c-section was needed. It was the strangest uniformity in a time like that. And I believe it was God showing us to a safe place. I could not be more proud of all my boys. Jerry, for being an absolute rock during labor and taking charge when I needed him the most. Oscar for being completely smitten with his baby brother, being extra gentle and caring with mama’s “band-aid”, and having a blast with whichever caregiver is hanging with him. 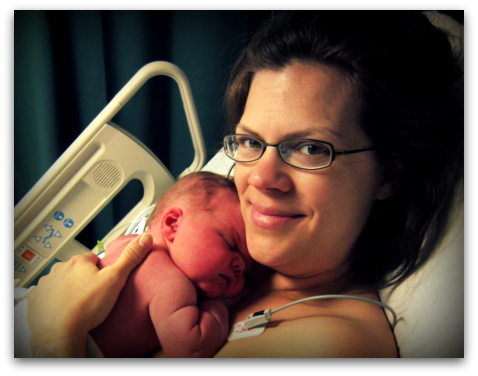 And for Calvin, my little holdout, staying strong through labor and delivery and nursing like a champ from the start. I know I will be processing this for some time. I adore my sweet Calvin and I am overjoyed that our family is complete. We are advised not to try and get pregnant again and we will probably take that advice. I am grieved that this much anticipated time has been tarnished with feelings of trauma and physical pain from both my uterine and bladder rupture, but each day is infinitely better than the last. Our births are behind us and now we have these amazing boys. It’s impossible to not feel immensely blessed. I am starting to come up for air. Want more Parenting posts? There’s a tab for that. When I heard the details of your delivery and what happened, I was terrified. I was also with Mom a/k/a the Trauma Nurse who described medically what could happen and cried like a baby. Now? I cry because you and Calvin are a-ok. Miracle of prayer and God being present with all of you. How terrifying. I can only imagine what you must have been feeling when you were in surgery. I’m so happy that you and Calvin are doing well. Take good care of yourself so you heal up nicely!!! It is beautiful to hear how the Lord directed both you and Jerry on the timing of the c-section. I am in awe of His saving grace! I will continue to pray for healing for you through all this. You are an amazing woman, wife, mother, and friend!! Oh my goodness! This made me cry! I’m so glad that you followed your gut and that you are both okay. Oh girl, I’m so glad things turned out leaving the two of you healthy! God was truly watching over you two and now you are home with your little blessing. Amazing! Congrats, again. I hope you are healing quickly and as painlessly as possible. So, so glad that you went with your gut and that you and Calvin are okay. Congrats! So happy for you. Your family is beautiful! Did your husband tell you that I said you kick a heckuva lotta (expletive deleted for the sake of others)? Well, if he didn’t, you do. You are seriously one of the strongest women I know or even heard of! And I am so thankful for your heart and your words. Hug your beautiful family and when the testosterone consumes your house, come on over for some chocolate pudding and a sappy movie. oh boy…tears…tears…tears…. 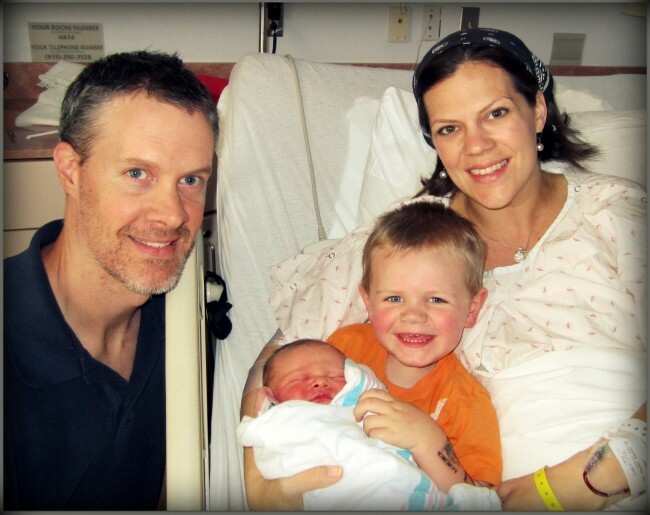 So grateful for God’s protection over you….so happy your family of 4…you and your boys….are all healthy and complete. Sad for all you had to go through but so value your honesty and sharing it all with us. You are beautiful and strong and I pray for quick and supernatural healing of all the physical scars and the emotional ones too. Much love and hugs to you! Can’t wait to meet Calvin at Roan Mt this Christmas!!! Your family is so beautiful inside and out. Love you guys. I’m praying for you all whenever you come to mind. If you and Jerry want to have Oscar come over and play with the boys, I’m your gal. I’ll do what ever I can to help you get the time you need to recover and work through all this. Oh Andrea…wow. I’m speechless. I am so thankful and praising God you did what you did and got the c-section when you did. His timing and grace indeed! I will pray for your recovery and processing time. You are one strong woman! Unbelievable, so glad that you and Calvin are both ok. And he is perfect. Way to go, mama. What a great testament to you and your family’s faith in God and God’s faithfulness! I am sorry for your loss of the birth you wanted and future possible pregnancies. I am sorry that it makes this time harder than it is for a lot of mommies, that doesn’t seem fair or right. I am praying for your recovery, rejoicing over your new family, and thanking God for how He has His hand on you. Go easy on yourself in processing and remember, it happens in stages and a different paces during different times. Lots of hugs and I wish I could be there to help in person, Malachi would love a play date with Oscar! So many loving prayers of peace and gratitude on your behalf. I am so, so glad that everything worked out well. And so sorry you have the stain of trauma over his birth. You know you did everything you could do. You know this was needed. You know that God was in control every step of the way. I love you. Take care of yourself – be kind to yourself – the next few weeks especially. Surround yourself with loving people, loving words and loving hugs of healing. Crazy. Every little bit of it. Love you Updykes! Your post brought tears to my eyes. It hurts my head to hear about delivery stories but when the topic arises, I feel the urge to share mine. I guess it’s the warrior in me that wants to be reminded of the experience. Your son is beautiful. So glad it all worked out so well. Blessings! Hearing your story gives me the chills. I was advised right after c/s #1 not to try a VBAC, so it never occurred to me. Hearing your story makes me realize why they gave me that advice. You and your family were truly watched over, and I love that everything came out for the best in the end. My healing thoughts are sent your way. I truly believe that was the case. How incredibly amazing. clearly, your intuition was right in knowing what you needed. it was so clear that everyone you trusted knew it to and was brave enough to say that. really thankful for your wellness- your whole family’s wellness. may the healing continue! I am SO glad that you and Calvin are okay. I can’t even begin to imagine all the emotions you are and were feeling. I am sending healing vibes to you every day. If I can do anything to help, let me know.